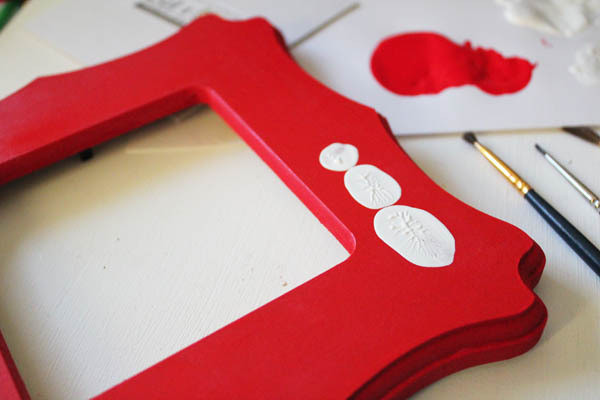 Kids love getting their fingers in paint… and if you don’t have a kid handy, you can still make this frame using your own fingerprints. Though, crafting with a kid is a lot of fun, although it tends to be messier. 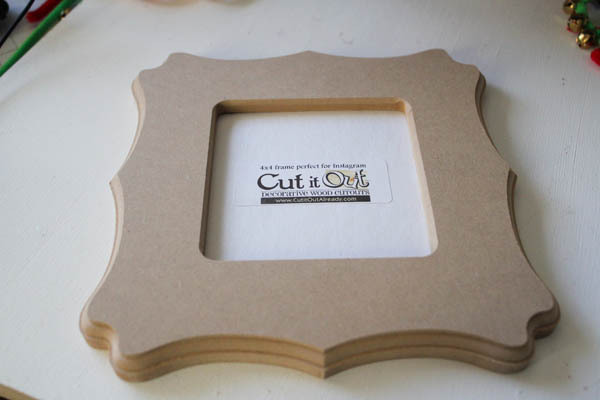 This frame will take you less than 15 minutes to decorate, as long as you have a cooperative kiddo on hand. 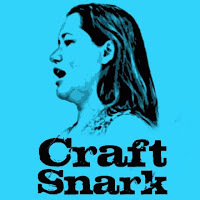 Which is why it gets to be part of this week’s Craft Lightning series! 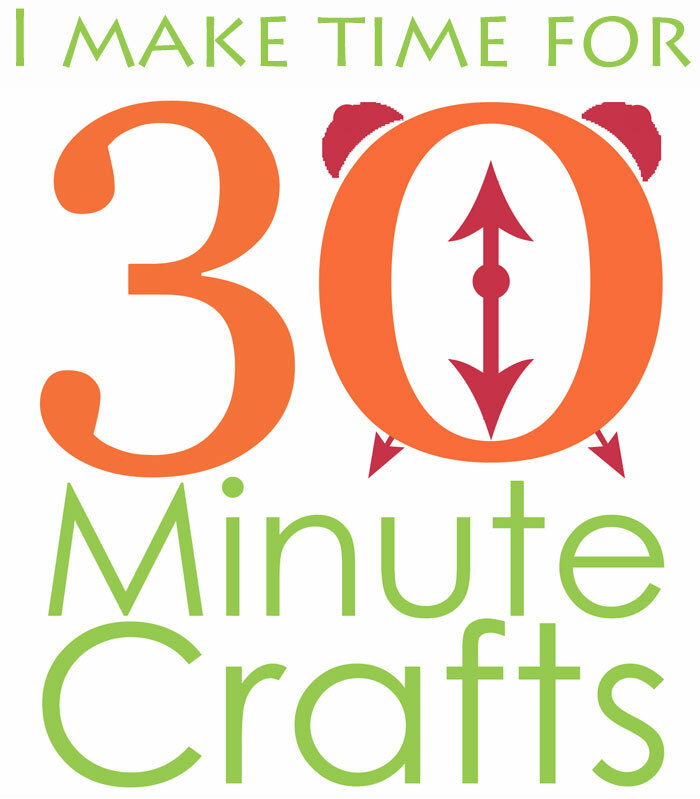 I’ve teamed up with Angie from the Country Chic Cottage this week, and each day we’re sharing a fast and easy holiday craft that takes 15 minutes or less. But we’re not doing it alone! 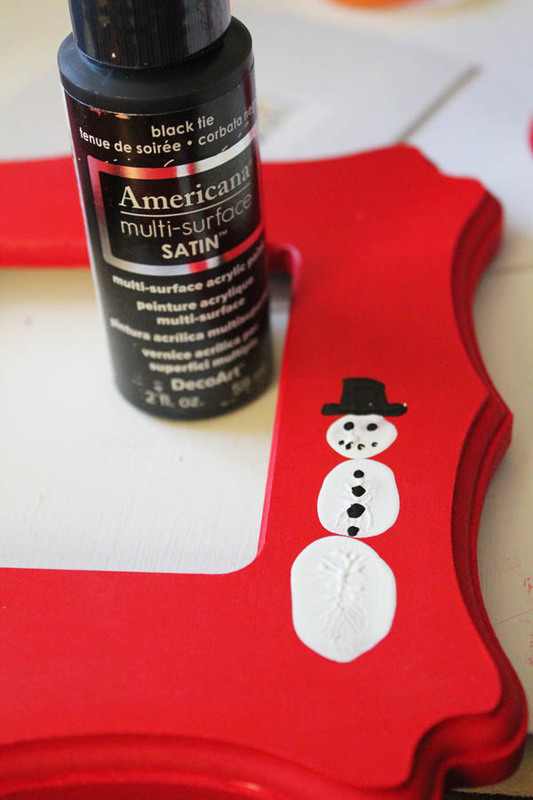 We’ve teamed up with a couple dozen of our favorite bloggers, who are also creating 15 minute or less Holiday crafts. And every evening, I’m sharing those with you. Go check out the Day 1 Roundup, Day 2 Roundup, and Day 3 Roundup if you’ve missed anything. Start by painting the frame red. The raw wood soaks up the paint really well, so it dries fast. 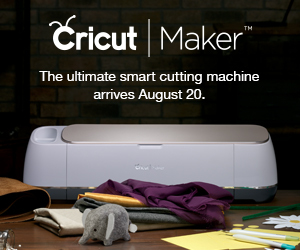 Start with a thumbprint of white paint. 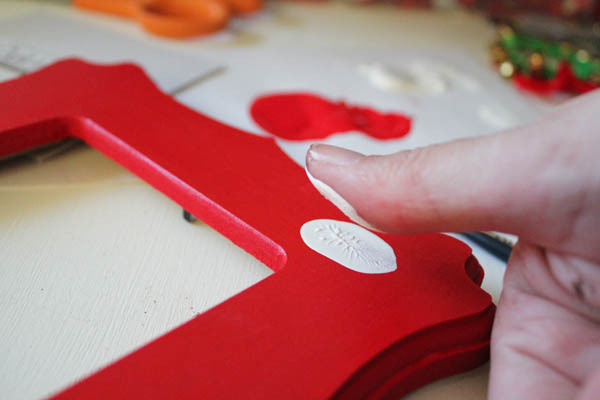 Practice on a piece of paper to see how much paint you need on your finger – you don’t want too much or too little. 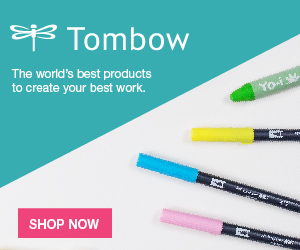 Make the body and head prints. You can use different sized thumbs (Dad, Mom, Kiddo), or you can use the same person’s hand ad use a thumb, ring finger, and pinky. 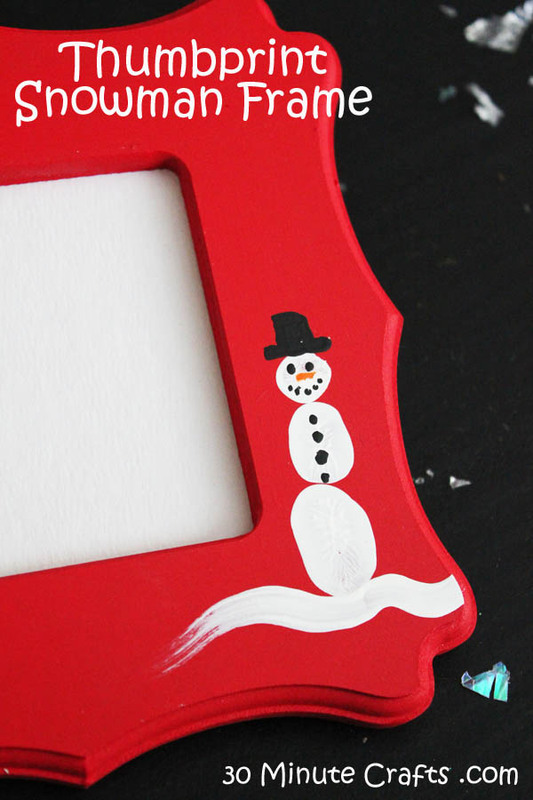 Use a fine tipped paintbrush to paint a hat, eyes, mouth, and dots up the front of the snowman. A little bit of orange with a fine tipped paintbrush is the nose. I added a squiggly line of white at the top and bottom of the frame. Totally optional. 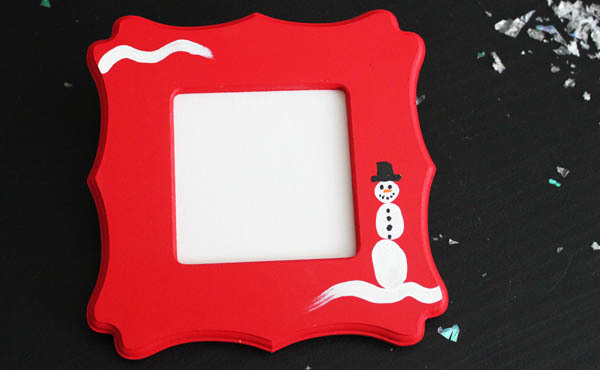 And it is that easy to whip up a fun frame… pop in a picture of the kids on Santa’s lap, decorating the tree, going caroling… or opening up presents on Christmas morning! 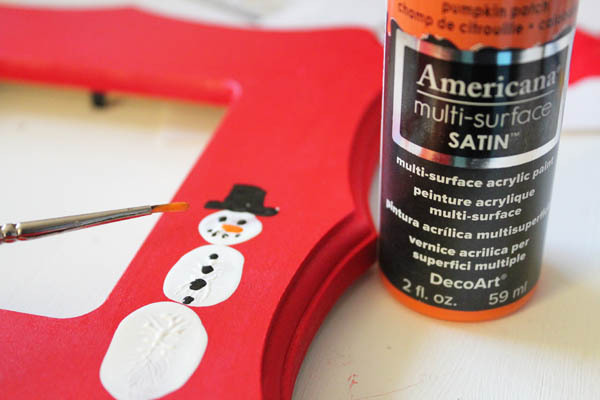 Be sure to come back tonight, for more fun and fast Holiday crafting ideas! 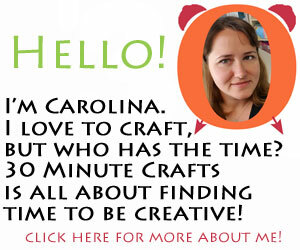 I love love love this Carolina! Great idea for a grandparents Christmas gift!